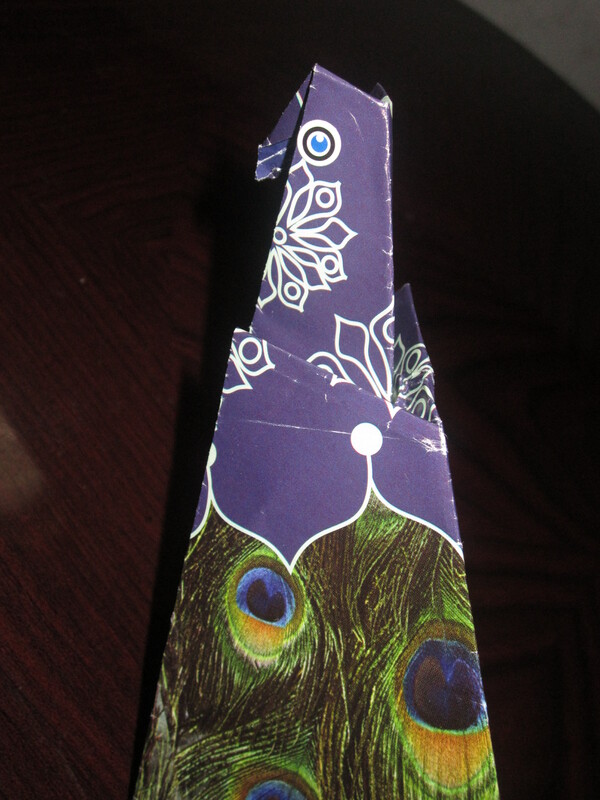 I am a failure at origami. My oldest daughter, crafty soul that she is, begged me to help her with some origami projects. Knowing my handicap for all things artsy and craftsy that require following a pattern, I decided that our best option was to purchase an origami book for kids, complete with simple step-by-step instructions and special papers. Surely if children can supposedly follow these directions and magically fold panda bears and peacocks, I (in all my grown-up wisdom) could also understand and succeed in folding a paper zoo. I can, after all, read, and that seemed to be the minimal requirement here. I was wrong (of course). Open book, choose the simplest pattern we can find and then select an appropriate paper. Fold the paper in half. Then open it back up. Fold it in half the other way. Then open it back up. Crease here, flip the paper, crease there. Smile in confidence at one another in the assurance that we have finally mastered this whole origami thing. Look at us! Our paper absolutely totally matches the diagram in the book. We return to the instructions with renewed confidence. Reverse internal fold, flip, crease, outside reverse fold, open up, fold to center, reverse, flip, spin around, repeat, pull out the flap, push in and squash, inflate, rotate, fold and unfold, mountain fold. Then I declare with supreme Mom-wisdom that what we really need here is a YouTube video with step-by-step instructions. We Google search. We find a video. We pause it after each step and make our paper look like the paper on the computer screen. We fold. We create. We conquer (sort of). The fact is that I’m not adept at following picture patterns in books and matching my every move to the instructions given, not with origami, sewing, knitting or crafts of any kind. I have too many questions that the pattern doesn’t answer and too many places where I can go wrong. I can’t visualize the finished product and the steps needed to get there. What’s true for me in arts and crafts is sometimes true in life also. We all can choose the patterns for our lives and then we make continual choices, daily decisions, to yield, bend and fold . . . or not. Do not conform to the pattern of this world, but be transformed by the renewing of your mind. Then you will be able to test and approve what God’s will is—his good, pleasing and perfect will (Romans 12:2 NIV). The pattern of the world isn’t meant for us. The world’s priorities, its pursuits, its dialogue and messages, and its destination all fold us into a crazy mess of disorder and frustration. We can choose instead to “follow the pattern of the sound words . . .in the faith and love that are in Christ Jesus” (2 Timothy 1:3 ESV) and to “obey from your heart the pattern of teaching that has now claimed your allegiance” (Romans 6:17 ESV). Yes, Scripture is our pattern to follow and Christ is our model: the picture in the book that tells us what we should look like in the end. Yet, while we may choose which pattern to follow, the world or the Word, God Himself takes a hands-on approach to our lives. “We are God’s handiwork,” after all—the result of His efforts, the creation He forms and re-forms daily (Ephesians 2:10). So, He is at work folding and unfolding—sometimes moving us forward and then back again. He creases us now, teaching us and working on us in ways that we won’t understand until years later when He uses those grooves as part of His plans for us and our ministry. He flips us around. He pushes us beyond what we thought were our limits. Sometimes He trims our edges. Sometimes we complain and balk at the confusing pattern as it unfolds. We look at the folds He has made in us and think He must be getting it all wrong. Surely this can’t become that. It’s confusing and we don’t see and understand. But He does. He knows what it takes to transform a piece of paper into a penguin or a peacock. He knows how to conform us “to the image of His Son” (Romans 8:29). Wow, so me. I’ve tried often to figure out how the creases and turns are going to work out. I just have to trust the He wrote the book and know how I’m suppose to turn out.